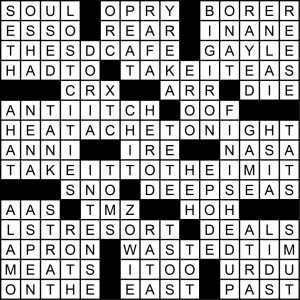 Prompt: The meta for this puzzle is a song by the Eagles. 17a. [Hangout spot for memory card wonks? (1)] = THE SD CAFE. From “The Sad Cafe,” missing an A. I don’t know what that SD stands for so this one went over my head. 21a. [Herbal beverage company started by a pundit and former “Star Trek” star? (7)] = TAKEI TEAS. George Takei, from “Take It Easy.” Sneaky how this one combined “take” and “it” before chopping the last letter off. 34a. [Miami Herald sports section headline after a grueling basketball defeat? (3)] = HEATACHE TONIGHT. From “Heartache Tonight.” Good one. 42a. [“We’re playing tag until you catch me!”? (2)] = TAKE IT TO THE I’M IT. From “Take It to the Limit.” I appreciate that there are a finite number of Eagles songs but this one stretches syntax a bit farther than it wants to go. 55a. [Nickname for a museum containing numerous WWII relics, with “The”? (5)] = LST RESORT. Again, a bit strained. The museum wouldn’t really be a “resort” I don’t think. 69a. [With 9-Across, how Elon Musk posed for his latest publicity shot? (6)] = ON THE / BORER. From “On the Border.” This one was the funniest. Put the missing letters in order and they spell ALREADY. Since they’re GONE from the theme entries, we can safely presume that the contest answer is their 1974 hit “Already Gone.” Cute mechanism. So that was easy and fun, and it looks like not many folks were fooled (464 correct answers with 20 minutes left on the clock), which is as it should be for February Muller (not that they get progressively harder in a uniform way throughout the year, but still — February’s gotta be gentle). The phrases remaining were a bit tough to parse or unamusing in some cases, and the fill got pretty ratty with seven themers darting about — lots of old friends like EROO, ITOO, TSOS, and SNO running around. But it’s all in the name of a fun meta and I didn’t actually get naticked anywhere so not the end of the world. 4.25 stars, and now for the first time in a while we have to wait a full month for the next Muller Meta. See you then. This entry was posted in Daily Puzzles and tagged contests, Muller Monthly Music Meta, Pete Muller. Bookmark the permalink. People seemed to like this one a lot – 464 was the final total of correct answers – four shy of a record. Difficulty will stay pretty easy for the next few puzzles. SD = “Secure Digital” – the common memory card format found in cameras and phones. You know your Honda models and/or English bands better than I do. I guessed CRV/VTC there.